In 1930 the Cretan healer Nikolaos Konstantinos Theodorakis of Meronas re-copied a notebook containing medical lore passed down through his family over generations. The present volume offers an edition of this notebook together with an English translation, the first of its kind. It belongs to the genre of iatrosophia, practical handbooks dating mainly to the 17th to 19th centuries which compiled healing wisdom, along with snippets of agricultural, meteorological and veterinary advice, and admixtures of religion, astrology and magic. Both fascinating and of critical importance, iatrosophia allow glimpses of classical and Byzantine medical sources and illustrate the vitality and resilience of Greek traditional medical and botanical knowledge. From years spent exploring local healing customs in Crete's Amari region, Patricia Clark is able to present Theodorakis' iatrosophion against a rich historical, geographical and social background. 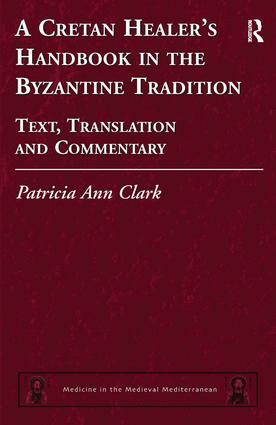 Introductory essays and explanatory notes to the translation give context to the iatrosophion and provide the specialized information necessary for a good understanding of the text. The abundant materia medica of the notebook is treated in a substantial appendix. Each animal, mineral, plant or product is provided with an overview of its various names through the millennia. Such entries are not only a key to understanding the Greek medical legacy, but also a vivid illustration of its usage from antiquity to the present day. Contents: Foreword; Iatrosophia; Historical background: Crete and iatrosophia; Crete's Amari: social and geographical context; Theodorakis: the man and his work; Text, translation and notes; Preface to the appendix; Appendix: materia medica; Bibliography; Preface to the indices; Indices; General index.